With the demise of the Plastic Bike came many decisions. What exactly do I want? The titanium road bike I've dreamed of owning for the past 12 years or so? A cool steel rig? Another plastic bike? 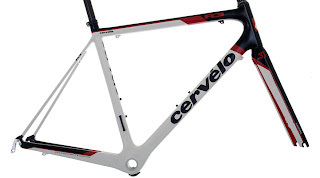 Do I buy a replacement frameset or complete bike? With a tight budget, the ti bike was ruled out. 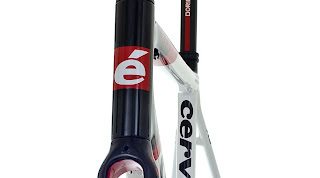 Even with my industry connections, I'd still be looking at a couple thousand bucks just for the frame and fork. Steel? I love my steel Gunnar CX bike and also considered buying a Waterford, but being the techy weight weenie that I am, I didn't think a steel bike would fulfill my road bike needs and a deluxe one would still be a princely sum. 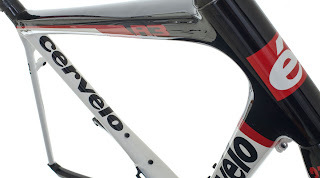 A friend and coworker bought a Cervélo this spring. I had always admired their fine rides, but for some reason the bikes and brand never really clicked with me. 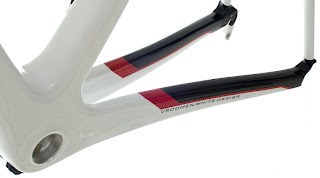 However, after seeing his frameset in person and checking out the details, along with spending some time on their thorough website, I was sold. 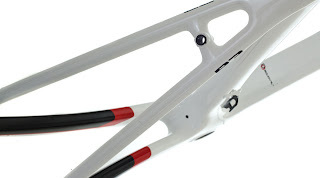 Not only are Cervélos some of the most advanced carbon fiber composite frames on the market, but they're not unaffordable. Um, whatever that means. sit back and admire those micro seatstays! An R3 seemed to be the best choice for my riding style and budget. It's very light, coming in at 950g (2.09 lbs), including the headset bearings. Plus it looks pretty bitchin' to boot. I ended up buying a complete bike as it was a much better value than the frameset. However, virtually every drivetrain component, as well as the wheels, saddle and bar/stem will be sold off to make way for nicer bits that I'm either purchasing, already have from the old bike, or am getting from friends (thanks Don, thanks Jason!). Until all the parts arrive, I'll have a stunning frameset staring me down, awaiting the first time I can clip in and spin the cranks. think Allie will mind relocating to the guest room for the next few nights? Why don't you just stab me in the neck with a meat thermometer? I mean, I guess it's better than some stupid "S" bike but sheesh. Sorry KVH, but your company makes bikes that compete with bikes from the company that I work for. Oh, and the only way I'd own a Pressurized is if I actually worked for the company (not bloody likely).